Google Glass is the hot property on the internet right now, especially amongst those of us that live and breathe technology. But it’s not just those of us that happen to spend our time inside the tech bubble that are interested in Google’s bold push for computer equipped spectacles – even the mainstream media are getting in on the action. This week, Google Glass found itself getting the Saturday Night Live treatment, the show’s ‘Weekend Update’ put Glass firmly in its sights, with fictional tech blogger Randall Meeks showing off his new toy. As you might expect, the parody review isn’t entirely serious, but if you like a laugh along with your technology then it’s well worth watching. Of course, due to NBC being the source of the video, you’ll need to find it on YouTube if you happen to live outside the United States. If not, then watch away. While Google Glass is not the first technological masterpiece to find its way onto such a show, it’s testament to how important Glass may be. The epitome of a niche product – it’s only available to buy if you’re on Google’s list of VIPs at the moment, and are willing to sign your life away in the process – Glass could be forgiven for flying under the radar of the great unwashed masses. But it isn’t. 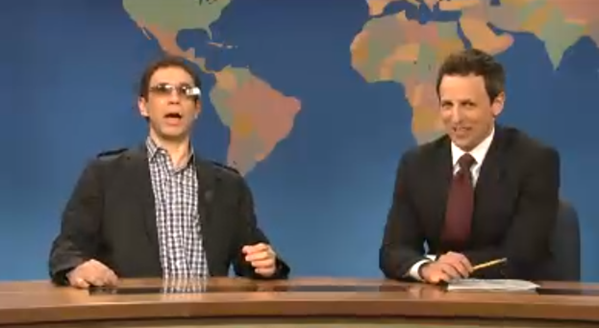 Instead, everyone is talking about Google Glass, from the tech blogs to the Saturday Night Live viewership. Certainly set to polarize opinion, Glass is certainly pushing boundaries, and that’s always going to garner attention. Whether that’s good or bad attention, is debatable. What’s also interesting is that Glass is creating all this buzz when nobody can actually buy it! If you were lucky enough to pick one up, you’re not allowed to let anyone borrow it, or even use it for that matter. Google will, apparently, hunt you down and take your left kidney if you do. Or something like that. We can’t wait to check Glass out ourselves, no matter what the folks at Saturday Night Live have to say.